The Hills Warehouse is the engine room of the company! It covers over 30,000 square feet across a mix of high rise palette racking, mezzanine floors and specialist storage systems. The warehouse department has 2 teams responsible for goods in and goods out. We operate a paperless system, every product gets scanned in and scanned out using mobile scanning units. This increases efficiency twofold - both in accuracy of inventory and accuracy of order picking resulting in improved customer service levels. 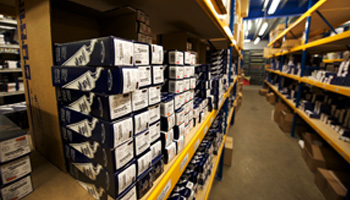 It also streamlines our ability to control stock levels of over 12,000 products spanning over 25 brands.